The town of Altmar, population 354 at last count, is a curious one. Way up in NY, near Lake Ontario, it is not near anything famous for land dwellers. Syracuse is an hour away, and it is a long 4.5-hour drive from Boston. But, for fly anglers, it offers this: the elusive, brutish and beautiful steelhead of the Salmon River. Steelhead are nothing more than large rainbow trout that live most of their days in the ocean, or in this case, the deep and dark depths of Lake Ontario. But, these fish are different from trout. They are much larger, up to 30″ or more. And, they’re very strong. The Salmon River steelhead are typically 25″ or so. But, that is still a lot of fish to handle. In the late-winter, steelhead begin to head, miraculously and with pinpoint precision, to the exact spot on the exact stream or river from which they hatched. They return there to spawn. And so, Altmar becomes a target destination for those like me. You go there to fish the Salmon River and try your hand at steelhead. I took five days this week to do just that. I’ve long wanted to go there, and, when you turn 50, your brain begins prodding you to get going on your personal Bucket List. 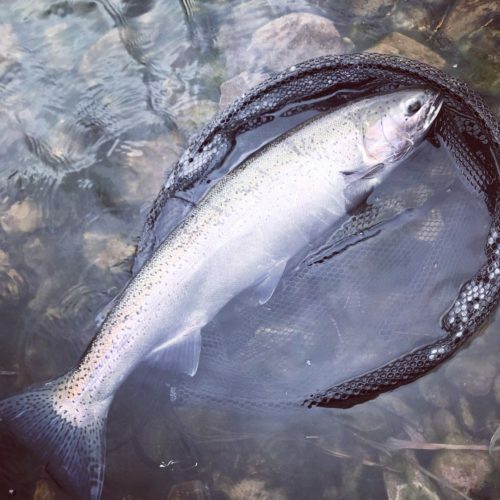 Fishing for steelhead is legendary. 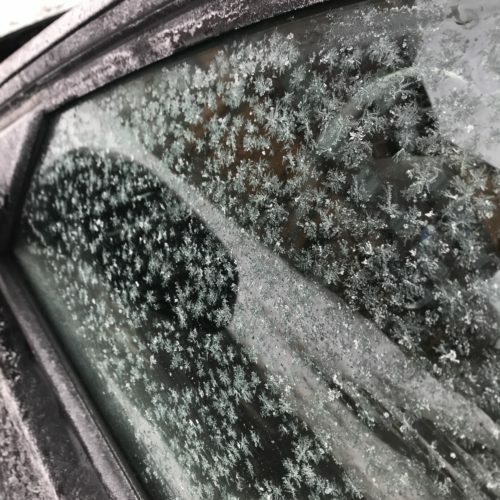 Weather conditions are usually frigid, windy or both. The water is 32 °F many days and 36 °F when it “warms up”. It takes a few trips, often, before you can land your first steelhead. That is because fish focused on spawning don’t eat. So, strikes are very few. 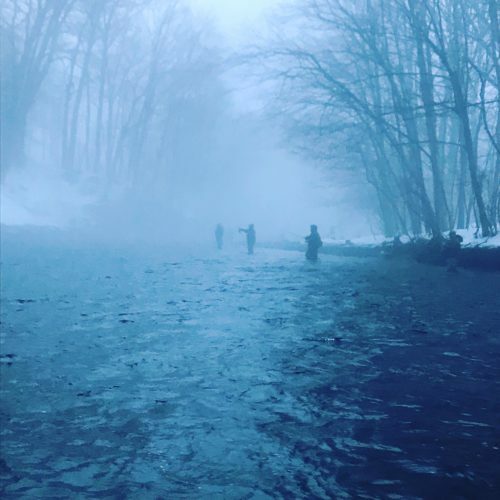 As someone said, steelhead fishing involves hours of cold and boredom, punctuated by episodic and brief moments of panic. And, when that time comes, when a steelhead takes your fly not out of hunger but out of curiosity or instinct, and you are able to set the hook at the right time, it is as though a stick of dynamite explodes in front of you, except that it is a leaping and writhing monster of a fish. Rarely have you ever felt such a powerful presence. Steelhead are just brutes. Finally, there is the challenge of landing a steelhead. Use too thick of a tippet, and the fish will shy away. Too thin, and the fish will break off. 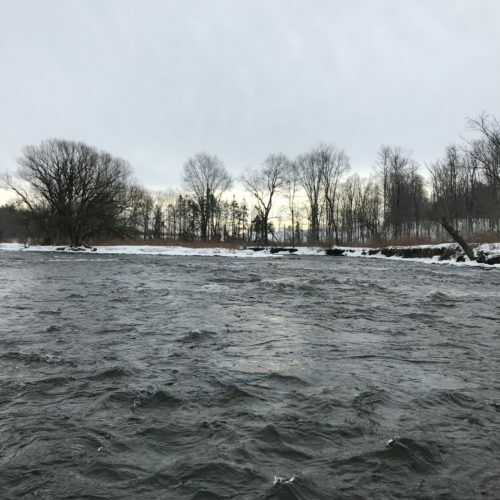 So, even when a fish is on, they are very hard to tame and often escape by surging into the Salmon River’s white waters, leaving many anglers with forlorn looks and slumped shoulders. 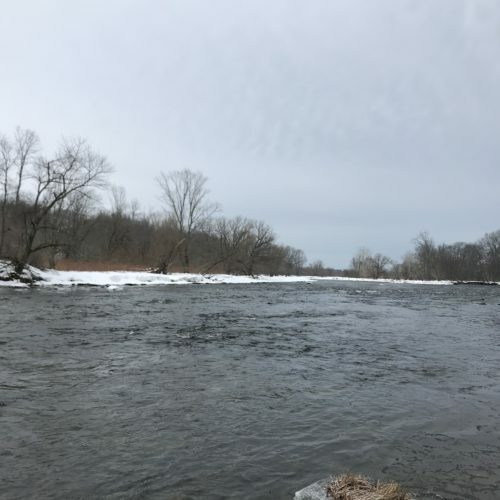 So, yes, my spring break this week comprised of this affair: arriving at the river well before dawn, fishing in freezing water all day, munching on PB&J sandwiches for lunch, lest I leave my spot in the river and someone else grabs it. On one morning, it was 15 °F at dawn. On such a fishing trip, shaving is not necessary. No one cares what you look like, and most of the guys (I didn’t see a single female fishing) have beards anyways. You get up at 5 am, fish almost non-stop, return late to the motel for your single hot meal of the day, shower, go to bed, and do the same thing the next day. On the drive over, I stopped at a new river along the way and fished for a few hours. 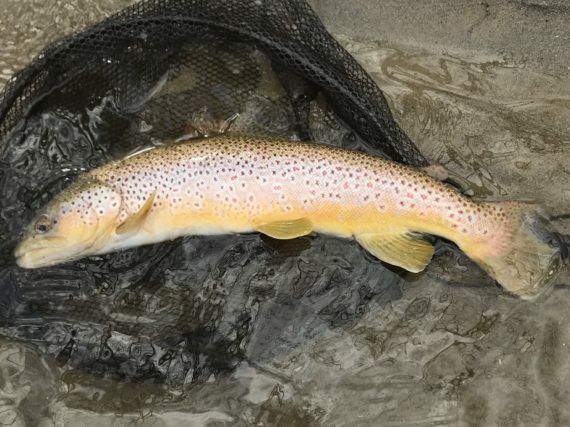 I landed a 22″ wild brown trout. And, at the Salmon River, I hooked five fish and landed a 23″ steelhead, my very first. It was a fight to remember. The steelhead surged and surged, but, fortunately, I was able to tame it. I’ve never landed a fish as powerful as that one. I almost landed a second one.